Do you remember the film the Creature from the Black Lagoon? Whilst at the time of the launch of that film it was mean to be a serious horror film, watching it today you cannot help but laugh at some of the animations used in its production! 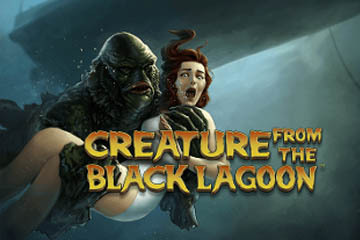 However, as usually happens with some of the older classic movies, one online slot game designer has chosen to bring that film back to life by bringing out a fully licensed slot themed completely around that film, and as such we now present to you our review of NetEnt’s Creature from the Black Lagoon slot! This is another of the growing number of slots from NetEnt on which you are going to be playing a fixed payline structure, and this slot has 20 pay lines each of which need a wager placing on them however you can play it for coin values that have been set as low as 0.01 and play from one to ten coins per payline too. You will be hoping that wild symbols get added to the screen as you are playing off any base game spin or when you are playing off the free spins bonus game on this slot game, for when they do so they will stick onto the screen for the very next spin you play off. There are in fact three different wild symbols that can be spun on when playing the Creature from the Black Lagoon slot game two of them are also spreading wild symbols that can spread around the screen turning non wild symbols into wild symbols during the free spins game and the other is a standard wild symbol that will stand in for all non bonus game awarding scatter symbols. You need three or more scatter Free Spin bonus symbols to spin into view to be awarded with the free spins game, a special target position comes into play during that feature game and wild symbols dropping into that position become spreading wild symbols as mentioned above. However, it is the number of scatter symbols that triggered the feature that determines just how many free spins you get to play off, and 10, 25 and 25 free spins are awarded when three, four or all five scatter symbols spin in respectively. Unlike the film you will find this slot is quite appealing, for the way its unique reel symbols can and will spring to life and its advanced sound effects you will always be assured of both an entertaining and fully rounded slot playing experience when you spin its five reels. Whilst the slot itself is a multi-stake slot game the fact you never have to download any software to play it does of course mean you can play it from anywhere and on any device that has a web browser attached to it, and play it is something we would recommend you do as it is a fun to play slot offering multiple winning opportunities. The payout percentages of most NetEnt slot games fall within one of several different ranges, and you will always have a fair and reasonable chance of winning when playing the Creature from the Black Lagoon slot as it comes with both a high RTP and is of course a completely random slot. Over the long term this slot has been designed to return to players 96.50% of their stakes as winning payouts but keep in mind that is over the long term, over the short term that RTP will fluctuate!